Make school cooler with a blast of Boom! Take Boom to school! With this backpack and soft-sides insulated lunch carrier set. Both the school bag and box have a really shiny chrome-foil background for the art to attract attention. They both also have black edges with a bolt/cog/gear/screw line drawing pattern all over. The backpack has shoulder straps, mesh water bottle side pocket, small snap shut side pocket, and thin square & arched secondary pockets. (under the art) the lunch bag has an adjustable red shoulder strap. 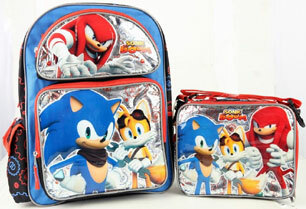 The bag has climbing Knuckles on top, and standing Sonic & Tails on the bottom. The lunch kit has everyone standing, with the logo at the top. The nice CG art & foil combo makes this a nice set for Boom fans. 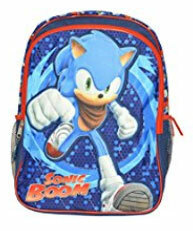 Another Boom backpack, this one a standard 16 inch size. It's built exactly the same way as the one above, with the separate top pocket, this time featuring Tails holding up a wrench, and the logo. The bottom square outside pocket has skeptical looking Knuckles & ready for action Sonic. The edges still have the flap side pocket & mesh side pocket, but the background here is a darker blue. Probably the same company is producing both bags, but who is doing it, and where can you buy these? It says "I'm Sonic Powered!" But why? What does it mean? 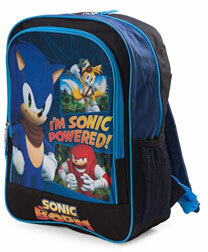 Is it that the bag or the wearer is powered by Sonic? It's nothing anyone ever said in the show. The bag is mostly black, with blue accents for the straps & zipper pulls. The design is all CG from the show with Tails cheering in the background, a close up of Sonic & Knuckles catching his fist under the slogan. The Boom logo appears under the design, on the black strip at the bottom. This is a standard size kids' school bag, at about 16 inches high. But what company made this & how much does it cost? "Let's Do This!" 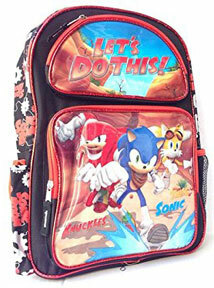 Sonic Boom themed kids school bag / back pack. It's a black bag with the desert canyon theme from the show/game. The edge has gears / cogs in white & outline scattered all over, along with the word "Sonic Boom" written in red. The top outer pocket has the scene & slogan, while the bottom square outer pocket has running Sonic, Knuckles & Tails, all labeled with their names. They've given Sonic's front foot a blue splash effect/energy effect. The side/edges has 1 mesh bottle pocket & 1 zip pocket. It's a pretty dynamic bag with nice scene & added edge design. This is a standard size kids' school bag, at about 16 inches high. But what company made this & how much does it cost? 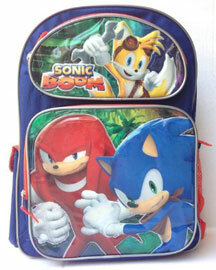 Here are some Sonic Boom themed school supplies. Once again, the design work here is good & thoughtful. The back pack has unusual/thick & sporty straps & maintains the Boom color scheme. The green part appears to have some sort of 'jungle' texture. The back has Sonic, Tails & Knuckles 'flying out' over the logo. The upper part is gray, with Eggman peering over the top. The pencils are fun, with "bamboo" look to fit in with the show & character portrait large round erasers for Amy, Tails, Sonic, Knuckles & Sticks. The pencil pouch/case is fun, with loads of differently sized square & rectangle colorful character tiles all over. Each item here stands out with fun color & very fitting Boom theme. These are great collectibles for Boom fans, regardless of use...but where are they sold? They appeared in fall 2016. Here's a Boom theme soft sides lunch box. It has a glossy plastic coating over the CG graphic for Sonic, Knuckles & Tails. The background has a bright green filter over a 'jungle villiage' scene from the show. 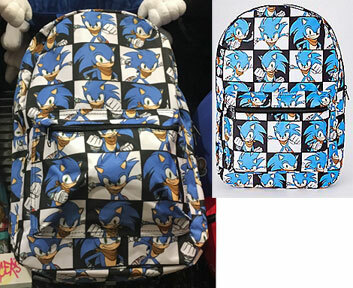 The edges of the bag are blue & use line art of each character in lighter blue as a decoration. It has a regular carry handle & longer red shoulder strap. It zips open around the edge with the red zipper. This is a 2015 winter item. Yet another standard size (About 16 inches) school backpack appears in late 2016. This one features just a big CG Sonic running with his fist out & a sort of blue 'energy ring' swirl in the background. 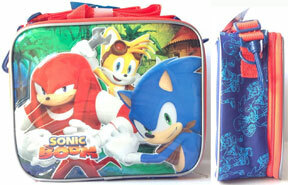 It has red accents & zipper/pulls & the words Sonic Boom printed in orange near the bottom, but it's not in the logo font. This does have a side-pocket, though it isn't shown. Which company has made this bag? These are Sonic Boom "Backpack Hangers". There are 10 different mini figures & they're blindpacked in these sort of shaped bags. You can get 4 different Sonics, Knuckles, Amy, Tails, Eggman, Sticks or a 'mystery figure' that....is very likely to also be Sonic. Why so many Sonics? Why not Orbot or Cubot? Where are these sold? The package seems to be in English and likely also French, so that gives a variety of possible places. Here's a new backpack in 2017 from Spencers' Gifts.